On June 30, at Arlington Cemetery, Gen. John P. Jumper, the Air Force chief of staff, honored the men and women from WWII, "Back in 1941, there was no Air Force. And today we recognize all the contributions of the men and women who were associated with airpower." According to the Air Force Print News, "Retired Lt. Col. William Czabaranek, who served as a bombardier, and Phyllis "Toby" Felker, who served as a Women's Airforce Service Pilot, accompanied General Jumper in the wreath-laying event. "The event moved to the Women in Military Service for America Memorial where General Jumper presented the World War II Honorable Service Lapel Pin, referred to as the Ruptured Duck because of its design, to the following veterans: retired Brig. Gen. George Bartlett, a Marine who served as a navigator-bombardier on B-25 bombers; Lorraine Rodgers, a WASP; Chester Buck, a staff sergeant who served as a crew chief; and retired Lt. Col. Lee A. 'Buddy' Archer, the only confirmed Tuskegee Airman ace." A MISSING TRAINEE FROM 43-3 BEEN IDENTIFIED. Can Her Participation be Confirmed? Texas Woman's University has recently transcribed and bound all of Betty Budde's WASP letters. Betty started her training in Houston on January 15, 1943, as part of the third class, 43-3. She was one 60 women with at least 75 hours of flying that started with this class and eventually became one of the 43 graduates. Betty traveled by train from California to Houston to start her WASP training. By the end of the first month of training, there were some final exams and check rides that resulted in several washouts (trainees that didn't qualify and were soon sent home). In Betty's letter home dated February 14, 1943, she states that she knew five of these women. One was Dorothy Davis from Pasadena whom she got to know on the train ride from California. Betty reported that Dorothy was "darned nice to everyone" and "we all wanted to see [her] make it." Byrd Granger's book, "ON FINAL APPROACH," provides a list of all the graduates and trainee washouts. It also documents that personnel records for some of the early classes were lost for a few of the washouts. Class 43-3 had two washouts with no record of their names and Dorothy Davis is not listed. Is she one of the missing two? The list of 43-3 trainee washouts does include a Dorothy Christenson Mitchell. It is possible to confirm Dorothy's participation through the National Personnel Records Center. However, much more personal data about Dorothy is needed from her family. Pasadena, CA is the only known link to her past. Another WASP trainee missing from the records was Virginia Stevenson of 44-3. On October 2, 1944, a B-25 spun into the ground 25 miles west of Victorville Army Air Base in southern California (northwest of San Bernardino) during a training mission. Three individuals lost their life in an instant: pilot - 1st Lt George D. Rosado, copilot - WASP Marie Michell Robinson of 44-2, and crew chief - S/Sgt Gordon L. Walker. In February, 2005, three individuals rediscovered the crash site: G. Pat Macha, his son Pat J. Macha, and a friend Dave Schurhammer. These men were on a special mission. They were hoping to find the site and then search it for any remaining items of value or interest to the families of those killed 60 years earlier. Soon after they located the site, they observed items from the crash. According to the story on Pat Macha's web site, they "were very surprised to find the WASP lapel insignia of Marie Michell Robinson lying in the surface sand undisturbed for more than half a century". Dave Schurhammer's closer examination of the site yielded a gold ring, coins and part of a bracelet. Dave is working with Veterans Affairs and the WASP organizations, in an effort to return all personal items from old crash sites to next of kin." This story was also covered by the L. A. Times. They included a picture of Marie's personal items, which were returned to her brother, Roy G. Michell, and her portrait. My thanks to Pat for allowing me to use his web site and reference some of his photos from their visit to the crash site. My thanks also to Dave Schurhammer for bringing all this to my attention. While in the WASPs, Marie became good friends with Elizabeth MacKethan Magid, "Kit". They made a pact while training in Sweetwater to be with the bereaved mother of the other if anything ever happened. Prior to visiting Marie's mother and just after completing a test flight where she recalled found memories of Marie, Kit penned a poem, "Celestial Flight, which is now read at most WASP departures." Please note, if you click on the thumbnail pictures above you can see a larger version of the photo. While gathering information for the Marie Michell story, I asked Pat Macha for status on the effort to recover Gertrude's P-51. He said, "The search on Santa Monica Bay did resume recently, but poor visibility ended that effort. We hope that late this month or early July will have improving sea conditions for us to continue." Gertrude was missing for four days before anyone really noticed. Pat added that this effort is only to confirm the crash site. There will be no attempt to recover the plane. A probable witness to the accident has been interviewed. Pat went on to say, "We would like to document the other ... WASP crash sites here in California." Two sites are "situated on, or near, operational airports and that presents a problem. Nonetheless we are going to give it a shot. " The crash sites Pat referred to are for Virginia Moffatt, 43-2, on October 5, 1943, near Ontario, Dorothy Scott, WAFS, on December 3, 1943, near Palm Springs, and Marion Toevs, 43-8, on February 18, 1944, near San Jose. In an era when World War II memories are catching public attention, the WASPs are also snagging Hollywood's attention. Stuart Benjamin, producer of "Ray," the Oscar-winning 2004 movie about singing legend Ray Charles, is among those interested. He said he would focus on "getting the WASP story told." "There's a particular spirit and courage about them. They stepped up when they were needed and did everything that men did. There was no reward for them except for the satisfaction of knowing what they did," he said. Robinson's story, Benjamin said, "is in many ways typical of the WASPs. They are people who did heroic things without recognition. There's a real spirit here, and I think that's part of what attracts me to the project." Stuart Benjamin was one of four producers for "Ray." My daughter was at the doctor's office recently getting her first flight physical. She wants to start her formal flying lessons. Her interests were piqued when she was a teen and Lois Ziler, WASP of 43-3, introduced her to flying. While she was in the doctor's waiting room, she found a magazine called "The AutoPILOT". She opened it and was pleasantly surprised to find a feature article about the WASP, "Women's Air Service Pilots Part II," by Marion Hodgson, WASP of 43-5. This article and the first installment in the premiere issue of the Mid-South edition summarize Marion's experience in the WASP and includes important experiences of other WASP experiences. Marion also authored "Winning My Wings." Just after the bombing of Pearl Harbor, Barbara J. Erickson London was working at the Boeing factory putting rivets in the wings for B-17s. By September of 1942, Barbara became the 14th woman to join Nancy Love's "Originals" in the Women's Auxiliary Ferrying Squadron (WAFS). On October 31, 1944, Barbara, as pilot, delivered her first B-17. Barbara's life story was recently detailed by Sarah Byrn Rickman in the summer issue of "AIR POWER History". Barbara was born on July 1, 1920. She took advantage of the Civilian Pilot Training (CPT) and by December, 1939, she had soloed. She went on to get her flight instructors certificate and became an instructor at the University of Washington. In January, 1943, Nancy Love put Barbara, at the age of 22, in charge of the 6th Ferrying Group at Long Beach. For more on the WAFS, refer to Sarah Byrn Rickmans's "The Originals - The Women's Auxiliary Ferrying Squadron of World War II." 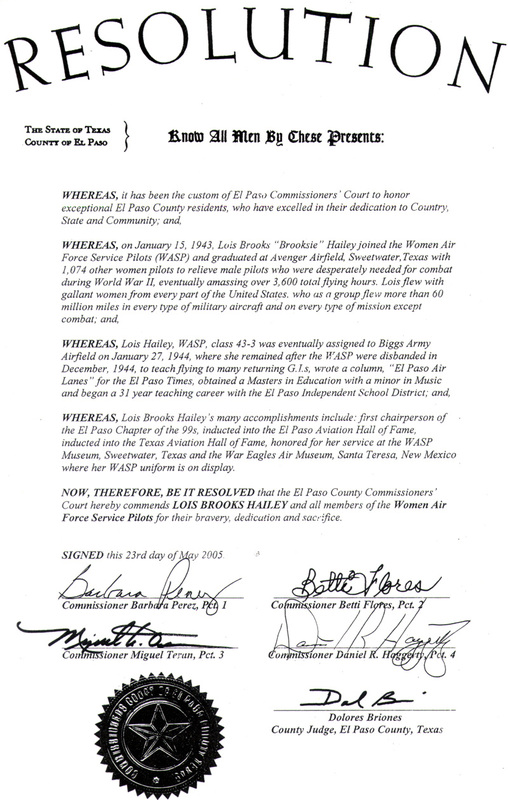 On May 23, 2005, Lois Hailey, of WASP class 43-3, accepted a resolution from the El Paso Commissioners Court in El Paso, Texas. 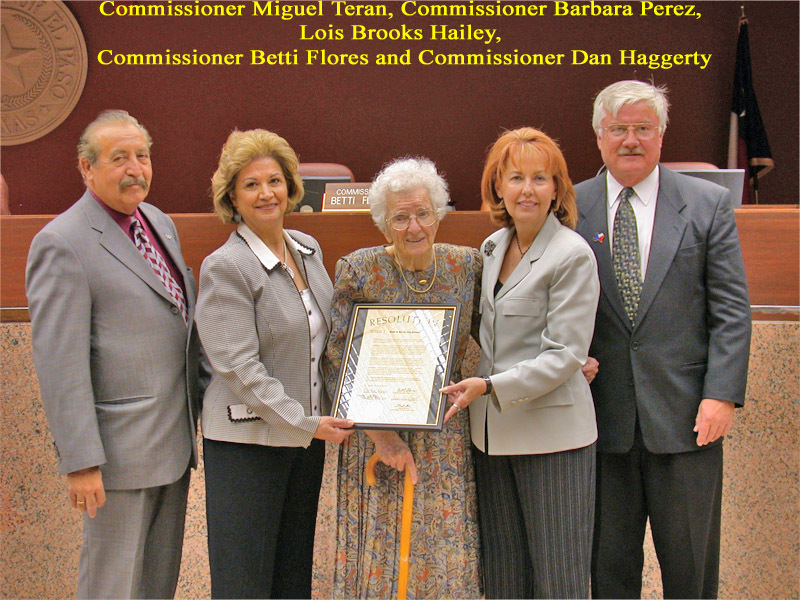 The resolution recognized the WASP for their contributions to WWII and Lois for her contributions to the El Paso community where she has lived since she first reported to Biggs Army Air Base in January 1944. The following day the El Paso times reported the story. Texas Woman's University was able to secure a video of the event and add it to their WASP archives.